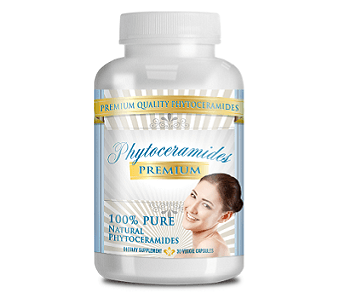 Phytoceramides supplements are best known for their anti-aging properties. Ceramides are a natural lipid found in the body that promote skin hydration. By supplementing the loss of ceramides that occurs during the aging process, phytoceramides aim to rejuvenate the skin for a youthful look. 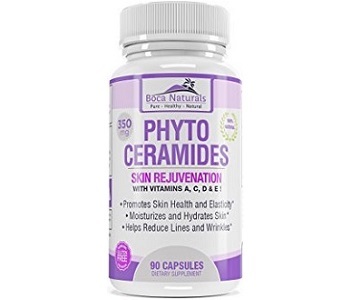 The following review of Boca Naturals Phytoceramides details information regarding this product’s effectiveness in reducing wrinkles and invigorating the skin. This product contains 350mg of phytoceramides which is common to many competitor products. The addition of Vitamin A, C, D, and E provide additional benefits to the skin. These antioxidants promote skin health by fighting the aging effects of UV rays, the formation of wrinkles and fine lines, and the production of free radicals which can cause cancer. In the right dosage, these ingredients can prove extremely beneficial. The lack of fillers, binders, and preservatives in this product make it an appealing product for skin health. However, many competitor products follow similar suit. It is recommended that, as a dietary supplement, adults should consume 1 capsule daily with 8 ounces of water. It is advised that a health practitioner is consulted prior to first use of this product. The clear instructions of use for optimal results give consumers confidence in their dosage of this supplement. However, the dosage outlined is common to many alternative products. Negative side effects are largely associated with wheat-based phytoceramides. This product is gluten-free and does not contain fillers, binders or artificial ingredients. Therefore, this product should not induce any negative side effects. At the time of writing this review, the product is unavailable on the majority of third-party websites. The price of this product is not listed and therefore, we cannot ascertain its affordability. There is no indication as to when stock will be available. The manufacturer claims that this product is backed by a 100% satisfaction guarantee. That being said, the return policy is not clearly stipulated. The lack of clear directions for return raise concerns regarding the efficacy of this product. We were unable to find sufficient reviews on this product which suggests that it is an unpopular choice on the market. This product contains several beneficial ingredients that promote skin health. The lack of fillers, binders, and preservatives coupled with the fact that this product is gluten-free, make it an appealing choice for improved skin. However, the product is unavailable at the time of writing this review. Without pricing information, we cannot accurately gauge the affordability of this product. While a guarantee is noted, the lack of stipulation regarding a return policy raises concerns about the product’s ability to deliver desired results. Therefore, we cannot recommend Boca Naturals Phytoceramides as an effective anti-aging skin care supplement.